As many of you know, I was in a Panhellenic sorority for three out of my four years in college! I transferred to Queens University of Charlotte at the beginning of my sophomore year, and went through Formal Recruitment (which is the biggest time of the year that sororities take new members for those of you unfamiliar with Greek life!) that fall. I became a sister of Alpha Delta Pi in September 2013 at the conclusion of recruitment, and overall I did enjoy my time in Greek Life throughout my college years at Queens. While I am happy to be currently finished with being a collegiate member in Greek Life (and happy to be done with college in general! ), and I am instead focusing on other endeavors in my life, I am still so proud to be a sister of Alpha Delta Pi, and do hope to get involved with the organization as an alumni someday. 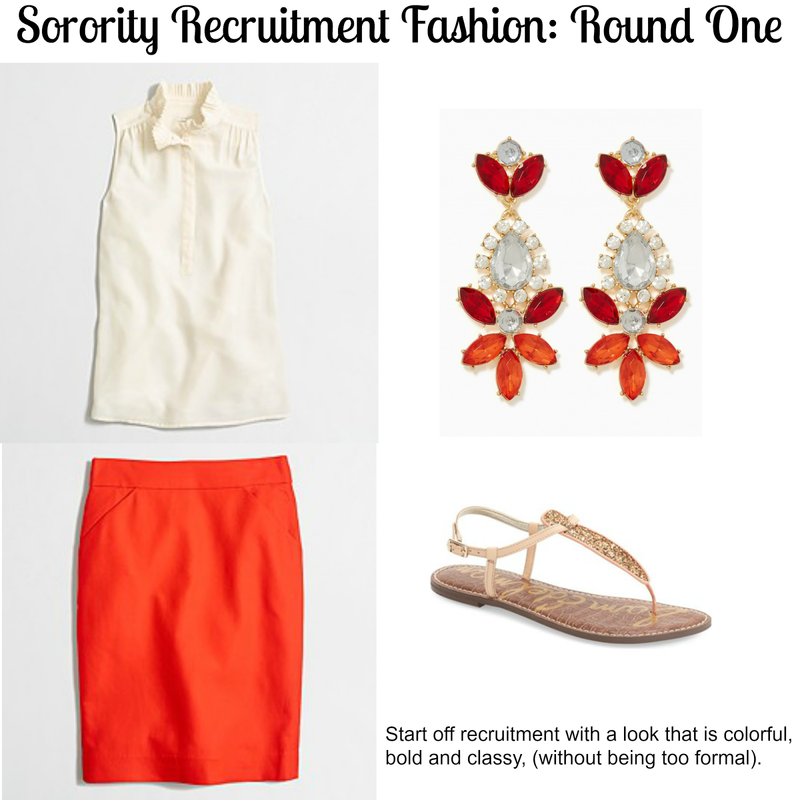 I thought that it would be fun to share some of my outfit inspiration ideas for any college ladies who read my blog that might be going through or considering sorority recruitment! The best part about today's post is that it's actually a collaboration with Audrey from Audrey Madison Stowe- but more on that later in the post! At Queens, sorority recruitment always took place about a month into the school year, and over a weekend. At larger universities throughout the nation, recruitment will often take place over a whole week either before the school year starts, or during the first week of school. If that's the case for your school, then you might need more outfits to wear! I was just using my own experience as a guide. My personal taste is to lean more towards traditionally preppy brands for recruitment attire. I featured a Lilly Pulitzer dress here for my second night outfit inspiration (I also wore a Lilly dress for my second night of recruitment! ), but I think that any dresses by Lauren James, Vineyard Vines, Kate Spade, or anything similar from department store brands would be find. When I went through Formal Recruitment, I found that the last night, Preference Round, was the hardest to dress for. It is a formal round, but your outfit should still be more conservative and not distracting or revealing. Many of the formal or semi-formal dresses that I had at school at the time were covered with embellishments, which would have been too much. I ended up wearing a simple green dress from Francesca's that fit me well, and dressing it up with wedges and coordinating gold and green jewelry. Me shortly before my third and final round of sorority recruitment, back in 2013! I think the Preference Round outfit that I featured here would be a great choice to wear! A cute pair of heels, some simple jewelry or hair accessories, and a bold but simple cocktail dress and you'll be good to go! I didn't feature any watches or purses in these collages, as the rules at my school for recruitment didn't encourage girls to bring either of these things to the recruitment rounds. I'm not sure if this varies school to school! 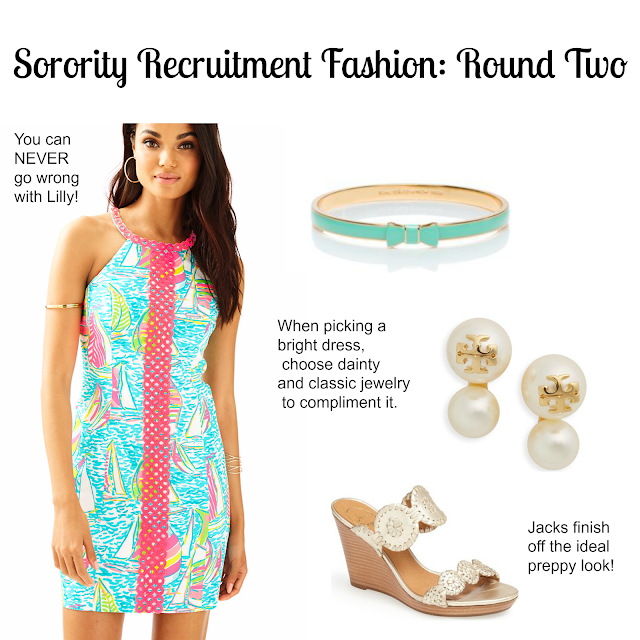 As I mentioned earlier, this sorority recruitment outfit post is a collaboration with one of my blogger friends! Audrey from Audrey Madison Stowe is a Zeta Tau Alpha and sophomore at Texas Tech University. Her school has a very different Greek life culture from mine- not only is about 75% of the school Greek (not sure what the percentage was at my college but I don't even think it was 25%! ), but the university itself is huge! Audrey's chapter alone is bigger then all four of the Panhellenic sororities at Queens. There are definitely pros and cons to being in large or small chapters of a sorority, but it's interesting for me to have met some friends through the blogging world who have had such different Greek life experiences than I did! 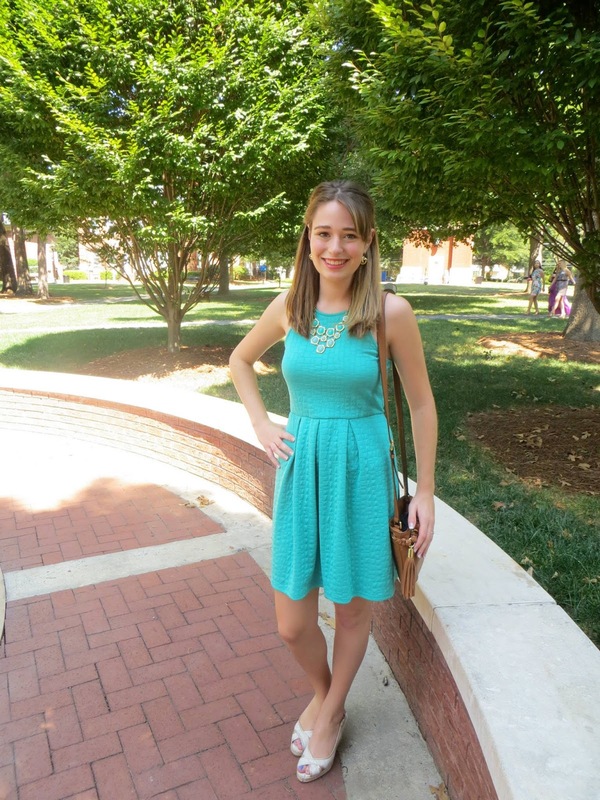 Go check out Audrey's guide to recruitment fashion today, and also follow her blog if you aren't! She's a total cutie, and is a fellow member of the Millennial Blogger Network. I hope this post was helpful to you if you're thinking about going through recruitment this year or in a future year! If you're also a college grad, were you in a sorority in college? How was your recruitment experience? I'm in a sorority myself and this guide was great! I love that purple dress and wardrobe scheme, its too cute! Tech definitely has a HUGE greek life! These are such great tips! My school did recruitment second semester and I always felt bad for the girls trying to look cute when it was freezing and usually snowing or raining out!